At the NAMM, Roland will present the EC-10 EL Cajon, a hybrid cajon with built-in electronic sounds. Sonor introduces 7 new cajon models and including 2 cajon pads. The new 2Face Cajon from Pearl Percussion has two distinct personalities, according to the company. In conjunction with percussionist Jesus Diaz, Pearl has created the Jesus Diaz Signature Radial Edge Cajon. 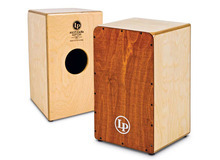 Tycoon Percussion announced the introduction of its new e-Cajon. Lauper Drums introduces thier Cajon Bass-Drum at the Musikmesse.